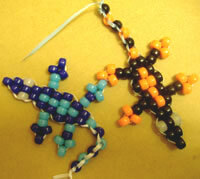 Creating a bead lizard is easy and fun - anyone can do it! As an added bonus, bead lizards are pretty much all the rage from elementary to early high school. Children and teens alike hang them on keychains and off their backpack zippers, so these make a great craft-time project for parents to do with their kids, or for older children to make on their own. Note: Pony beads come in a variety of sizes. I used 9mm, but 7mm would work, too - it would just make a smaller lizard. Optional: Keychain, lanyard hook or other object to hang your lizard on. Please see the bottom for instructions on how to do this. String 3 #1 (black) beads. Let one of them drop down to the middle of the ribbon, and hold the other two together, an inch or so from the end. Take the other end of the ribbon and string it through those two beads in the opposite direction, so there's a ribbon end coming out of each side of the two beads. Hold the two ends of the ribbon flush with one hand and pull the two beads down to the center of the ribbon with the other. You should now have two (very short) rows of beads. You should have a little "triangle" now. Make sure you're going through the beads with both ends of the ribbon in opposite directions for each row, and always pull tight. This time, we're only going to use one end of ribbon. On that end, string two #1 beads and three #2 beads. Next, you're going to use that same end of the ribbon to go back through the two #1 beads, without going back through the three #2 beads. You might have to rearrange the 'claw' a little bit, but you've just created one leg! Repeat on the other side, so you have the two front legs completed. Leg time again! Make two legs, one on each side, just like in Steps 5 and 6. Almost done. String on a row of two #1 beads, and then you're at the tail. For the tail, you're just doing one bead per row. I like to alternate between the #1 and #2 beads, starting with #2. You can make your tail as long as you want, though the 40" ribbon won't go far past eight or nine beads. The final knot to secure your bead lizard is really easy with ribbon - you just need to tie two overhand knots. Sometimes, I tie two knots, then slide the ribbon ends back through the final bead, then finish with two more knots, just to make it extra secure. Basically, all you have to do is tie the ribbon on the keychain/hook using a Larks Head Knot. You then skip that first row and start with two #1 beads. Go show off your awesome bead lizard!